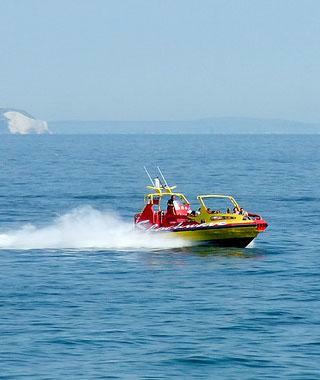 Head east to the nearby Jurassic Coast and take in the seaside scenery and wildlife on a 90-minute RIB speed boat ride. The Jurassic Coast is aptly named for its abundant fossils and complete geological record of the Jurassic period. A staple on the Bournemouth coastline, Hot Rocks is situated next to the beach with breathtaking views of the ocean. Enjoy delicious food and cocktails in a surf-themed atmosphere while watching the waves crash on the shore. If upscale shopping is what you’re after, Westbourne will not disappoint. Designer clothing boutiques, quaint coffee shops, and a variety of unique specialty shops provide retail therapy to locals and tourists alike. Plan an afternoon to peruse this Bournemouth district located on the way to Poole. Enjoy the serene park atmosphere in Bournemouth’s Lower gardens while perusing one of the longest running open air art displays in the country at the Pinewalk Art Exhibition. From emerging artists to seasoned professionals, this summertime exhibition displays a variety of pieces to captivate your creative side. An absolute must for any visiter to Bournemouth, these beachside getaways originated over 100 years ago in this very city. Enjoy the best the beach has to offer while taking refuge in the shade of these whimsical shelters. Rent for the day or even the week for the ultimate seaside sanctuary. There’s no better way to experience the ocean’s majesty than on a surfboard. Even if you’ve never touched a surfboard, the BSA certified coaches at Sorted Surf School are guaranteed to get you up and going in no time. You may find that you’re a natural—and decide to come back for the intermediate course! 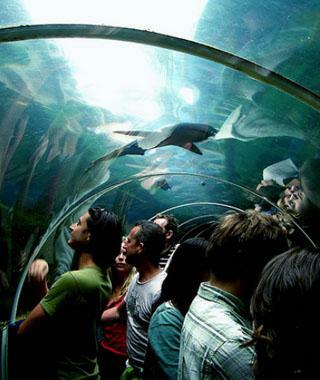 Discover the unique, beautiful, and some just plain weird creatures at Bournemouth’s award-winning aquarium. A variety of exhibits feature aquatic animals from all over the world, including South America, Africa, Australia, and the Caribbean. Take a virtual plunge in the world’s first Interactive Dive Cage or delight in the playful Otters at Otter Oasis. Take in the picturesque seaside flats on two wheels at the Bournemouth Promenade. Ride from Pier to Pier, enjoying a multitude of beachfront restaurants and attractions. Don’t have a bike? No worries, you can easily rent one on location. If walking several miles of sandy beaches isn’t your cup of tea, take a ride on one of Bournemouth’s land trains. Let the beautiful shoreline unfold as you journey along the Promenade to neighboring Boscombe Pier, Portman Ravine, and Alum Chine, among other locations. Children under 5 ride for free, making this a can’t-miss choice for families with young children. Chris Turberville-Tully works in the serviced accommodation industry across the UK, having been client side for many years previously. Headed to the Dorset region? Visit Serviced Apartments Apartments for accommodations that are far better than a hotel.